It's time of the month again for some beauty surprises, yay!!! 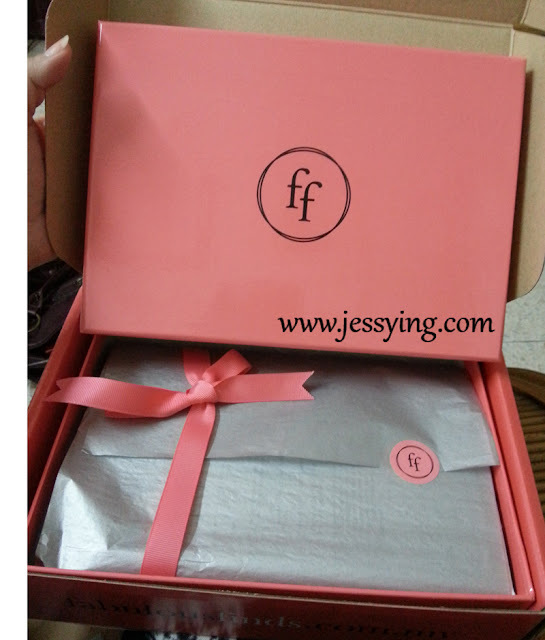 Let's un-box my September Fabulous Finds Beauty Box! 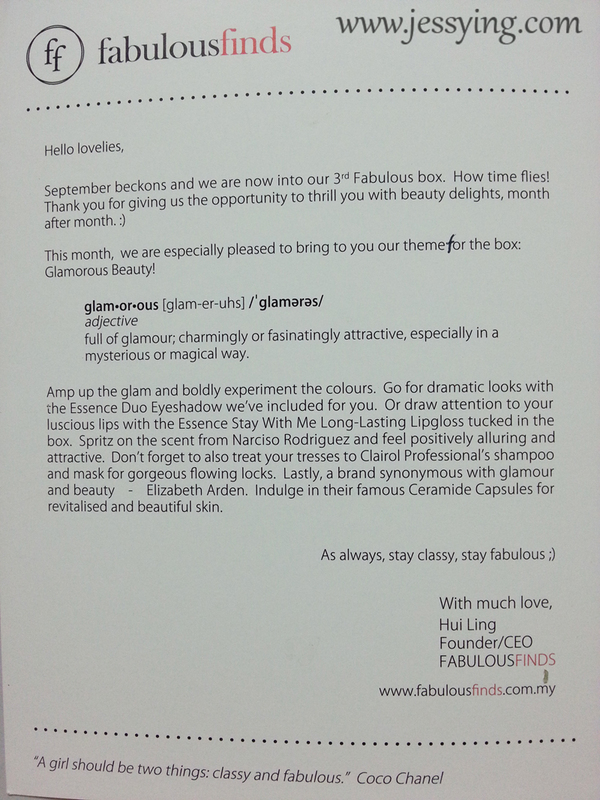 Love letter from Hui Ling, she said this month theme for the box is Glamour! Let's see how glamourous would this Sept Fabulous Finds Beauty Box would be! I was extremely glad to see this September Fabulous Finds Beauty Box contents, 3 full sizes and 3 samples with a mix of skincare, makeup, hair care & fragrance! 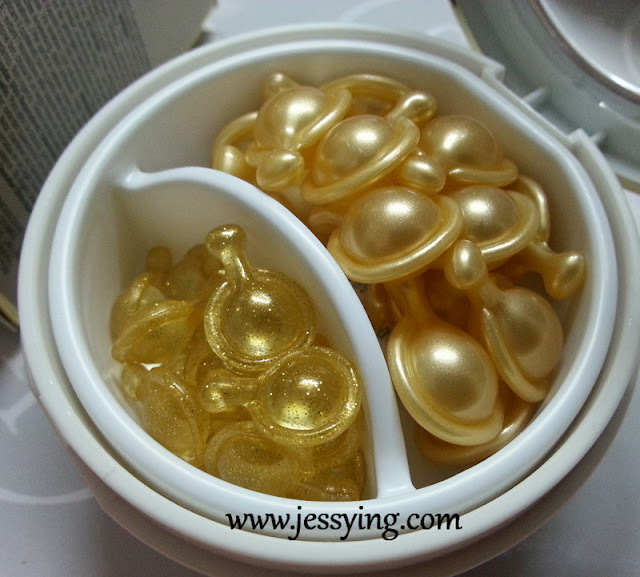 The highlight is of course the luxury looking Elizabeth Arden Ceramide Gold Ultra Restorative Capsules & Strengthening Eye Capsules which comes with 14 capsules for each type. 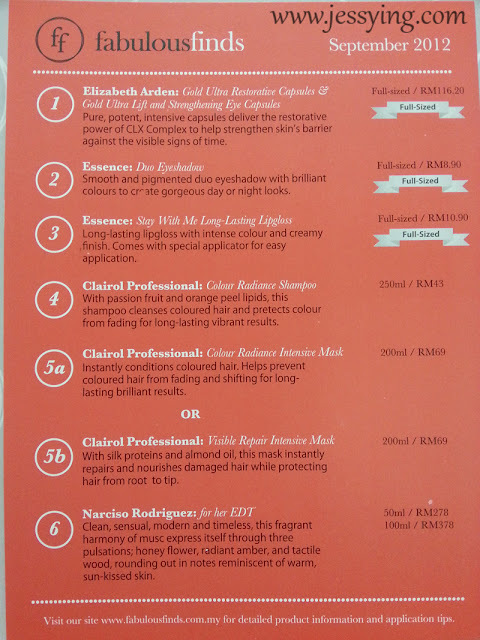 Seriously I havent tried anything from Elizabeth Arden before I dont know why, but my bestie Ellis is a big fan of them and swear by their skincare! 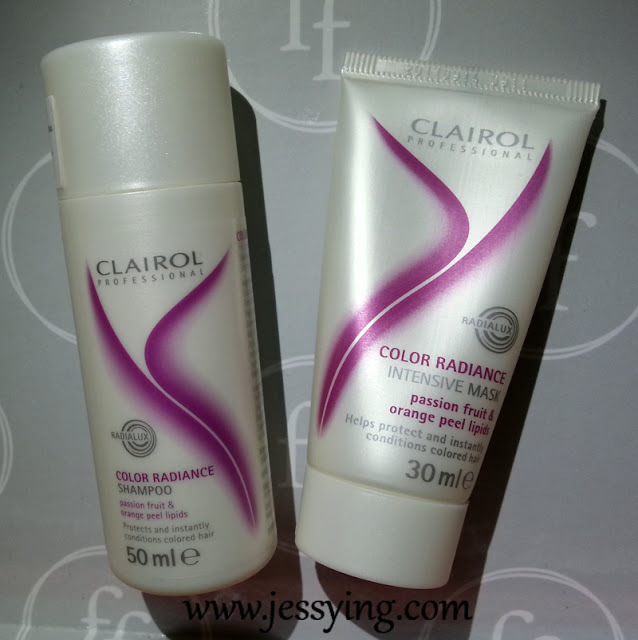 She let me tried her skincare range (for oily skin type one) but it does not suits my skin type hence I did not think much about it. Well this comes in time, I'm happy to try new stuff with a fraction of price we pay to subscribe! 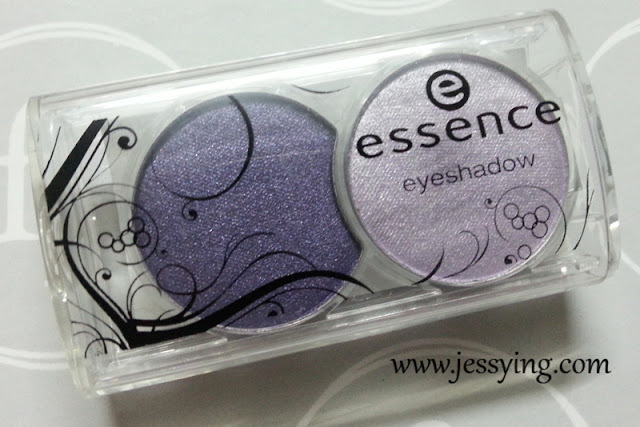 Essence Duo Eyeshadow in 07 Mix it, Baby! My first time trying Essence product and at least it did not fail me when I swatch it on my hand, it seems quite pigmented! However haven't really try on my eyes to tell whether it is really good. The thing is I have so many purple eyeshadow shades lying around in my room and I don't need another purple eyeshadow.. so I think I might this this away? From the packaging the colour seems really pretty right! When I opened it for the first time to try and swatch, I can smell the strong fragrance scent of the product and it kinda turns me off. 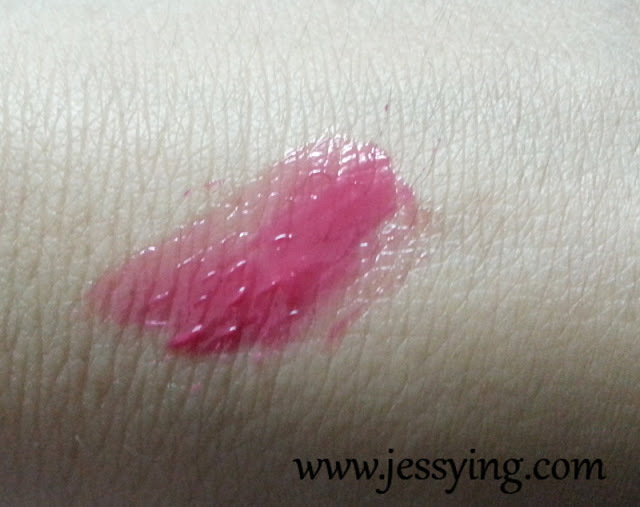 But when I swatched it oh I kinda like the colour which it showed; a very pretty raspeberry hot pink! The texture is very creamy and kinda long lasting because of the texture itself. This brand is made in Germany and I have not tried prior to this. The scent is lovely, has this fruity passion fruit & orange scent! Will be trying out this soon to see how it works! This is not the usual scent that I usually would buy & use but anyway I have put inside my handbag & decided to bring it along for my short beach holiday and try it .. will see if I like it. 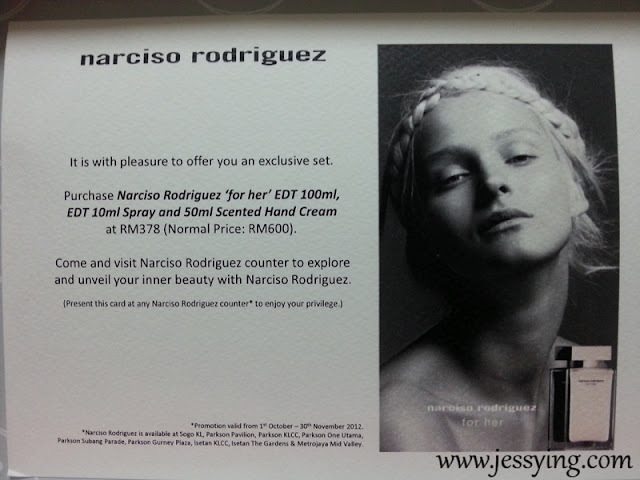 Attached in the box is also a card that gives subscriber an opportunity to buy the Narciso Rodriguez EDT 100ml at their usual price RM378 but comes with free miniature & hand cream! I was pretty happy to see Elizabeth Arden Ceramide Gold Ultra Restorative Capsules & Strengthening Eye Capsules in the box considering it is a full size and counter brand product. As for other stuffs like the Essence products, to me it is an extra bonus which I think I don't mind trying it when I feel like it. And I always love receiving hair care sampling for one reason because it is always great to carry around for travelling & these brands are new to me and I don't mind trying it! And this month delivery was slight a bit late but I'm glad that we are well informed by Hui Ling as there are so many public holidays few weeks ago which caused the delay. (ii) Annual : RM420 one time payment : Receive 1 free box. i.e. 12 months + 1 free box in 13th month. Transferrable to another party as gift. 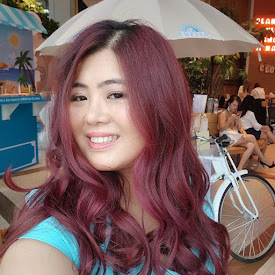 P/s: If you plan to subscribe, drop me your email here & allow me to send you the referral link to your email for you can sign up & I could in return earn 200 fabulouspoints for if you successfully subscribe. And when I reach 1000 fabulouspoints, I can receive the next box for free! And yes you girls should start recommending friends and earn some points too! Omg this Gimmick bag thing is catching on. Just saw glam bag and the one mich phan is doing also. Good idea to get people to try your products. Oh... the thing is I have more green shades than purple one.